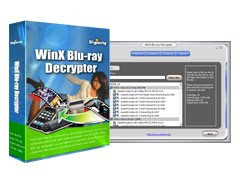 WinX Blu-ray Decrypter is specially designed to backup Blu-ray movies to your hard drive. With user-friendly interface, this Blu-ray decrypter enables you to easily decrypt and copy Blu-ray movies with Blu-ray DVD drive to your computer by removing all protections from BD video, including encryption (AACS), BD+ copy protection, etc. It is fully compatible with all BD media. Download software and activate it.